The fabled “Lost City” of Atlantis is one of mankind’s greatest and most enduring mysteries. First written of 2,350 years ago by the Greek philosopher Plato in his works the Timaeus and the Critias, the island beneath the sea has fascinated historians, poets, and the public ever since, but has remained tantalisingly hidden, shrouded in myth, legend and exaggeration. However, a new book by acclaimed historian Andrew Collins provides for the first time a clear argument for the civilisation’s existence and a pointer to its location. Plato described Atlantis as an empire founded by the sea god Poseidon on a land mass the size of “Libya and Asia put together”. It possessed a thriving capital, with sumptuous palaces, royal courts and harbours constantly receiving vessels from all over the world. 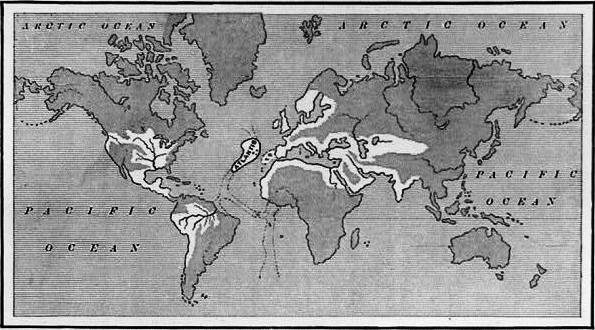 For many generations, it ruled the Atlantic Ocean as well as parts of what Plato called “the opposite continent”, what we now know as the Americas. Its downfall came when its masters set their sights on conquering the Mediterranean. The Greeks rose in defiance and, in a terrible naval battle, defeated the Atlanteans. In the wake of this defeat, the god Zeus unleashed earthquakes and floods and submerged the island of Atlantis in a single “terrible day and night”. Plato gives two dates for this catastrophe: 8,570 BC in the Timaeus, and 9,421 BC in the Critias. More than 2,000 books have been written about Plato’s lost kingdom, placing it in the Americas, the mid-Atlantic, North Africa, Northern Europe and Antarctica. The current favourite location in academic circles is Crete. But Collins says we must look for Atlantis in the place where Plato said it was all along: the Atlantic. In the Critias, he records that the island had a vast, irrigated plain that “stretched for three thousand stadia [552km] in one direction, and at its centre, for two thousand [368km] inland from the coast”. To the north, west and east were “mountain ranges” stretching to the shoreline, and the southern end of the plain was at sea level and housed the great capitol. Plato was thus describing an east-west oriented island, perhaps as little as 700km by 400km in size. The great size attributed to Atlantis by Plato refers not to the “home” island, but to the extent of the empire over which the Kings of Atlantis held dominion. The Empire consisted of a series of islands that lay in front of the “opposite continent”. But if the opposite continent was the Americas, and thus the series of islands referred to situated on the West Atlantic seaboard, then how could Plato, writing in 350 BC, know of their existence? After all, America was discovered by Christopher Columbus in 1492. Yet there is evidence to suggest that there was transatlantic contact thousands of years before Columbus. In Paris in 1976, the mummy of Egyptian Pharaoh Rameses II was found to contain tobacco. The implications were clear; the tobacco plant, thought to have been introduced to the west by Sir Walter Raleigh was known in the Ancient World as early as 1200 BC. In 1992, the German toxicologist Svetlana Balabanova examined mummies in the Munich Museum. Extensive evidence was found of high amounts of cocaine having been absorbed into the bodies. Cocaine is the active ingredient of the coca plant, native only to the Americas. Thus the possibility stands that coca leaves were being imported to Ancient Egypt via transoceanic contact with the Americas. Also, in the eastern provinces of Mexico are great stone heads, each weighing several tonnes, positioned at the centres of the Olmec peoples who thrived between 1200 and 400 BC. They display Negroid features, suggesting the presence of black Africans in the American continent at this time. Other statues show Semitic features, suggesting contact with Mediterranean seafarers. AND the evidence mounts. As a consequence of the submergence of Atlantis, Plato tells us “the outer ocean [the Atlantic] cannot be crossed or explored, the way being blocked by mud, just below the surface, left by the settling down of the island”. This can only have been what we call the Sargasso Sea; the free floating seaweed stretching between the Azores and the Bahamas. The Bahamas are notorious for shallow banks and take their name from the Spanish “baja mar”, meaning shallow sea. It seems certain, concludes Collins, that Plato’s Atlantis was on the western Atlantic seaboard, somewhere in the Caribbean. In the Timaeus, Plato tells us the island was situated within easy reach of other islands that acted like stepping stones for voyagers. Such a description matches the chains of the Caribbean. The idea that Atlantis may have been in the Caribbean is not new. In 1798, Italian scholar Paul Cabrera identified Atlantis with Hispaniola, or Haiti and the Dominican Republic as the land mass is now called. He thought so “not only on account of its position and magnitude exceeding all others, but also from its fertility and numerous navigable rivers”. However, he picked the wrong island. Plato tells us “the district as a whole…was of great elevation and its coast precipitous”, an adequate enough description of Hispaniola’s mountainous coastline. However, the island had no strategic importance to seafarers, unlike neighbouring Cuba, whose many lobe-like bays made for better ports. Furthermore, Cuba’s coastal waters guard the northerly and southerly entrances to the Gulf of Mexico, making it ideal for journeys to Mexico or North America. Cabrera’s claim that Hispaniola was “in magnitude exceeding all others” is also wrong. At around 640km by 256km, it is around two thirds the size of Cuba. He also mentions Hispaniola’s “fertility” and Cuba is the most fertile island of the Caribbean, famous for tobacco and sugar. Cuba also has “numerous navigable rivers”. All this suggests Cuba is the location of Atlantis. According to Plato, “around the city was a plain, enclosing it and itself enclosed in turn by mountain ranges which came down to the sea”. The description matches Cuba’s western plain, that stretches from Havana westwards to Pinar del Rio. Until around 9,000 years ago, the plain extended southwards, across what is today the bay of Batabano to the Isle of Youth. In other words a great plain, drowned in part during the time Plato wrote of. And it is the great drowning, the “terrible day and night”, that provides the last piece in the puzzle. Just such a cataclysm did annihilate the western Atlantic at the time Plato posits for the destruction of Atlantis. In around 8500 BC, a comet exploded above North America. The fragments made more than 500,000 craters, known as the Carolina Bays, ranging from a few hundred metres to 11km in length. Each explosion held the force of a small nuclear blast, causing a huge tidal wave drowning the Caribbean and Bahamas. Any great civilisation on Cuba would almost certainly have been razed, ruined, and lost to the sea – as if Zeus himself had struck it down. Gateway to Atlantis, by Andrew Collins with an introduction by David Rohl, published by Headline, at �18.99, is available from The Express Bookshop, 250 Western Avenue, London W3 6EE or call 0870 901 9101.